It’s been a busy but inspiring spring here at XStreamReports. One of our talented consultants, Mika Manner, attended two Exstream events, one of which was the OpenText Innovation Tour in Stockholm. The setting for this event was at the Grand Hotel, Stockholm, with beautiful scenarios close to the Royal Palace. Mark Barrenechea talked about how many companies have been looking at data security as a non prioritized matter, and shared several examples where the that has lead to data-breaches that have caused a lot of damage to those companies and its’ customers. One of them being the Cambridge Analytics/Facebook case that was heavily covered in media recently. Another example was Boeing, they were hacked and as a result became vulnerable for attacks. Mr. Barrenechea pointed out that companies have to raise the priority of security from position 7, as it is today, to be number 1 to be able to mitigate these risks and limit the possible damage that can be seen as a result. Together with Mats Hultin, CIO of SAAB, Mr. Barrenechea also discussed and shared how digital information has changed, and how today everything is more real-time and more intelligent, with the usage of OpenText Magellan and Cloud Solutions. Mr. Berry presented an overview and explanation of what the OpenText Cloud is, but also what it is not; it is not to be considered as a competitor to Azure or Amazon Cloud. OpenText Cloud is not a hardware in the cloud provider. 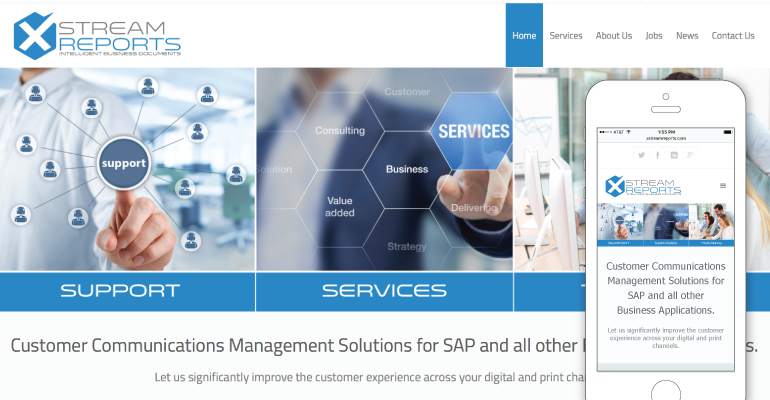 It is instead a SaaS solution where customers will be able to use OpenText Cloud Services for communicating with businesses and customers in a simple, centralized and flexible way. The new release of version 16.4 is the most advanced cloud ready version of Exstream. Although the focus on cloud solutions is now really getting into speed, it is important to remember it is still in the early stages. The hybrid solution where some of the software remains on premise will be here to stay for a long time according to Mr. Berry. In the breakout sessions focusing on the Experience track, we were presented with the new features of Exstream (former HP Exstream and StreamServe) available with 16.4, on examples for how those features can be used. For example, you can use voice and image recognition using the AI to maximize the business communication, or with the voice recognition you can use the AI instead of human operators to assist with customer communication. For the image recognition example, object identification was showcased where an image with a family was shown where the AI recognized if the people in the image were male or female, and water and trees. 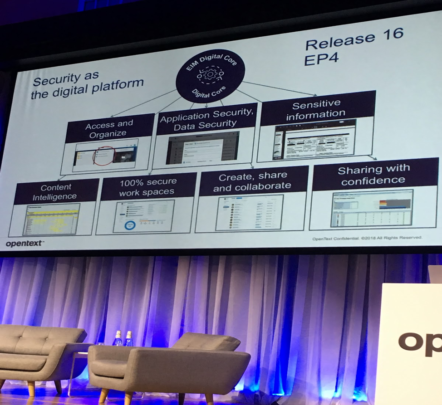 Christian Askland, Director of Product Management at OpenText, went through the upgrading procedure and the benefits of upgrading to 16.4. For instance there are some really nice new features like mail tracking and job visualization where you will get detailed information on how the job went. There is also support for more analytics with of the usage.  For example reports related to processing volumes connected to the transaction based license. Other features to highlight is the ability to use images and rich media from Media Management integration, I.e. common CAS Browser, assured delivery of communications with OpenText notifications and even more features making it possible to deploy changes to documents without involving the IT department. We were shown a releaseplan with even more AI functionality, like having video recognition, to be included in the future of OpenText CCM. 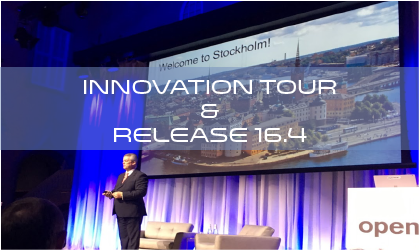 OpenText Innovation Tour was a great event, OpenText hosts it in multiple cities every year, and we hope to see you at one of these events next year! 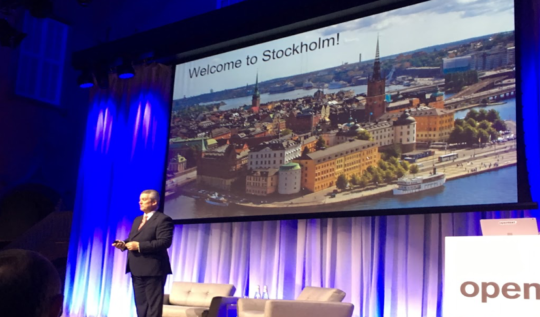 We attended the SURG meeting in Stockholm Sweden a few of weeks ago, and wanted to share some thoughts and good information for those of you who were not there. The day was kicked off with Christian Askland, Director Product Management OpenText, sharing the platform overview and roadmap. There were not a lot of surprises on what’s to come compared with what has been shared previously, however notably we can see release EP4 is now more defined and now includes Job visualization and tracking, and more REST APIs. Exstream will move more and more to the cloud and web services, and Control Center will be one of those. Customers will be offered the CCM as a cloud service. I.e. Paas, Platform as a Service. By entering in log-in information on a website, the whole environment (tenant) was created in the cloud. In the 16.4 version you will be able to use job visualization and tracking in the Supervisor. This is something that was in the Process Manager in version 3.x and was dropped from the 4.x version until now. We’ve been exploring 16.3 since it was available earlier this month and there are some really nice features in the 16.3 version. One of them being able to use SparkPost to track emails. This will give you valuable information about whether the email has been read or not. A demo was shown on how to upgrade to version 16.3 by Mikael Friberg, and he recommended building projects using one Main project and then have several subprojects to make it easier to work with. Also worth noting that Scandux argument is reintroduced due to customer requests. In 16.3 you also have the possibility to use role-based Retouch where you can define what resources specific groups of users can access, and changes can be made to documents in seconds. PageOUT is obsolete and discontinued. Scalable Vector Graphics (SVG) objects can now be used in CAS and use of script on output connectors is supported. In our last blog post we noted that it was yet to be clear what training for Exstream would look like, and that was clarified a little at this meeting. The latest training material is still only for 16.2, and OpenText will not have training material for 16.3 until spring of 2018. They are also completely changing the model for training, it is now Learning on Demand, where you can do the training on-line at your convenience with a yearly training subscription. You can find more information here: https://www.opentext.com/training/coursedetails.html?id=2392 The price for a yearly subscription is $5000 per year but only includes one certification attempt, additional certification can be done for a cost of $400. This makes training with OpenText a heavy investment, especially for someone who is just looking for a specific course/certification, but it can be beneficial for anyone who typically does a lot of training. Ericsson shared in their talk about how they’ve seen a significant decrease in the number of printed material, but an increase in electronic messaging and we will get more and more AI functionality in business. This is something we’re sure a lot of businesses are seeing, and will continue to do so. However, there will continue to be a demand in print as well, especially for business or organizations that are impacted by regulations in part to do so. Ericsson pointed out that even with print on a decline, one thing that will still be on demand when it comes to printing is label printing. Part of the day was also dedicated to covering GDPR and its implications for the industry when it goes into effect. In short the goal with GDPR is that there is a common process of how to protect data in the EU. Companies within the EU are obliged to provide information on what data is stored. If you want to know what data they have on you they will have to provide you with this information on request. If they do not, they will be fined heavily. We’ll cover this topic more closely shortly as it’s an important consideration for our EU clients. Overall, SURG was a great event and the new releases of features and applications we’ve seen so far with version 16, and the ones to come, will be great value adds for our clients. On Tuesday, we attended the OpenText Customer Experience Management User Group meeting in San Mateo, CA. It was a well-attended event with many organizations looking to hear from others that have implemented OpenText CEM solutions and get the latest product insights. Going to the User Group meeting was time well spent, and we hope that OpenText will host more of these in the Bay Area in the future! The panel discussion had representatives from Blue Cross/Blue Shield, Chevron, Franklin Templeton Investments and Kraft Heinz, as well as OpenText, and they provided some great insights from their experience going through a digital transformation and implementing OpenText CEM solutions. One of the main takeaways shared was not to wait until there is a request to show value, be proactive and publish, so that when the request comes, you are able to show growth and value over time. Another was that with any investment and digital transformation quest, every organization has their “aha moment” when they can show value and success with their implementation. This aha moment will look different to every organization, but some of the aha moments shared related to seeing the value of insights regarding their assets and what is most used, or being able to show people the benefit of creating device agnostic content that can then be used cross-channel, mobile, social etc. as achieved through using a product like Exstream. The panel also shared the advice that for any organization embarking on the journey of digital transformation, it’s important to keep it simple and to also consider the culture change. “It’s not just what you can do, it’s what you should do that’s important”. For some that means starting small, with a select set of documents or a specific business unit to show initial value before proceeding with other areas of the business. This is an approach we see often with our clients and can attest to as well. The capabilities with an OpenText CEM solution are extensive, but they should be used with intent and purpose for the best value for the business. 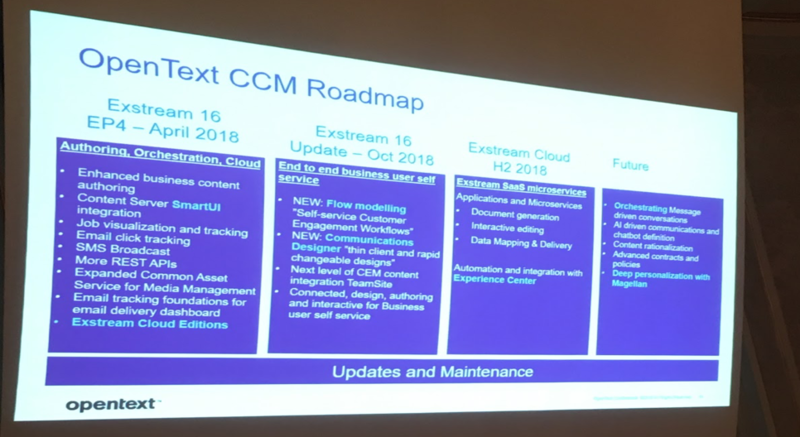 The focus of the CCM breakout session was OpenText Exstream, described as “a marriage of two solutions” Exstream and StreamServe (CCE) where both sides now get access to the benefits of the strengths from either product. Among those mentioned, for Exstream customers that never had a persistence layer that will now be available providing valuable job tracking and analytics, and StreamServe customers now getting access to the power behind Exstream and CAS being a core part of the platform for all channels. As with any merger or acquisition, there is a level of worry amongst customers and users that the product they’ve invested in will be going away, but OpenText ensured that both customers of HP Exstream and StreamServe can expect to be able to continue using the applications they’ve gotten used to, and that upgrading will not mean losing anything but rather have access to more benefits and capabilities. With EP3 coming out in a couple of weeks, there are some interesting news and updates to look forward to that are all part of OpenTexts’ efforts to stay committed to “efficient omni-channel communications”. We were given a preview demo of one of those, the new application Exstream Content Author. Exstream Content Author is part of the authoring solution, targeted for the business user and is intended to augment the Designer application. In the Exstream Content Author specific areas can be opened up to a marketing user (as an example), while keeping other areas and information static that that user can’t change. It will leverage CAS and in future releases will also support workflows, approvals and revision tracking is coming. We look forward to working with our clients to take full advantage of these new capabilities as they are released. Interesting to note from the information shared during this day was that although Exstream 16 is a “marriage of two solutions”, training is yet to be married for the two and is still separate for Exstream and StreamServe. Nothing was mentioned about when/if this will be the case in the future, but it’ll be interesting to see how long that will remain as such, as we are already seeing customers wanting that. By Mika Manner, XStreamReports/XSR Sweden. 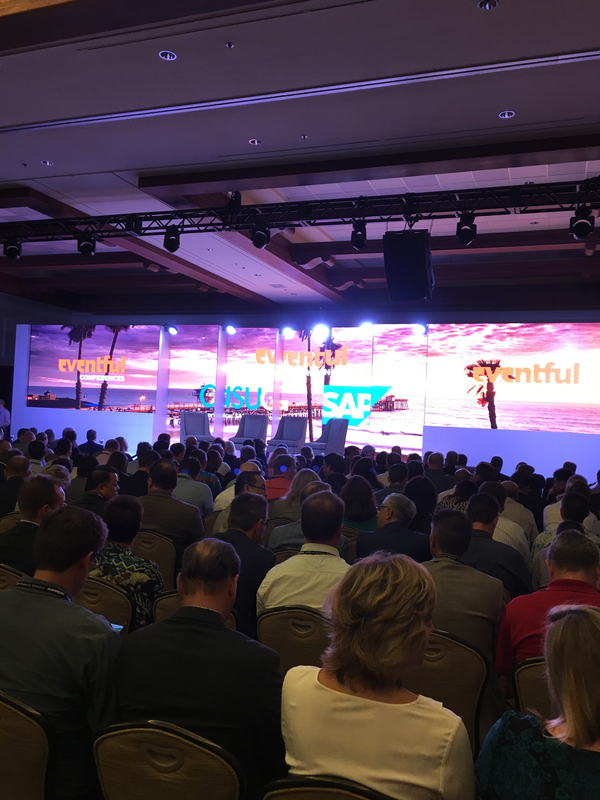 I had the pleasure of recently attending the 10th SAP for Utilities Conference in beautiful Huntington Beach, California at the Hyatt Regency Huntington Beach Resort and Spa. With more than 1000 attendees this was a great chance to meet customers, IT professionals and see where the future for SAP CCM in the utility industry lies. In addition to great industry networking and insights, it was an excellent location and service adding to a great overall experience. What is going on and what to expect? When attending presentations, the data analytics and business intelligence efficiency theme was apparent. The need for information to be provided in real-time is crucial for both companies and for its’ customers. Some of the main issues that came up hindering this was slow transfer of data and lack of multi-channel information options. Like in the case of Oklahoma Gas and Energy, Puget Sound Energy and DTE Energy, a lot of the information flow was restricted to a few options, mostly using callcenter, but also mail to communicate with the customers. During major outages this would lead to very long waiting in phonequeues and because of that cause a lot of irritation for the customers. This had an impact not only on their customers experience and as such customer relations, but also on the maintenance plans for these companies. A good example on how to improve the information flow speed was shared by E-ON, where they installed a cloud based solution in Microsoft Azure coupled with using SAP HANA as their data platform. Then implement multiple output channels for mobile, tablet and a web-portal services to get real time information distrusted. This allowed them to go from having a system response time from 10-600 seconds to less than 5 seconds. Replication of data load between SAP BW and SAP HANA is now done in real time, resulting in 1 minute compared to the previous 24 hours – huge improvements! We are going to see more and more solutions going over to be cloud based, if not fully then partly, and thus have a huge impact on both efficiency and cost reduction. Multi-channel options for self-service will be a norm in the future and already it’s apparent it is expected by customers. We at XStreamReports are very familiar with this, creating multi-channel solutions using StreamServe/OpenText technology, like the new Exstream product, to achieve document presentment both internally and externally. By doing so we maximize our clients investment and utilization of their software to provide their customers with an outstanding Customer Experience. A key factor in a successful project and implementation is keeping everyone involved informed. Everyone involved does not only mean the key persons working on the project, but also employees/users that will use the system as well. Having seen projects where users have almost been forced to work with a new system is not beneficial to anyone. I’ve seen cases where employees have resigned due to this. Involvement and training are key factors for a successful project. This was showcased in a presentation where Accenture worked with DTE Energy where they also brought in extra staff to cope with the system transition, proving essential. Doing a thorough analysis of the project, avoiding scope creep and not being afraid to postpone parts of project that are not vital for the Go-Live are other valuable thoughts to remember to keep in mind for long-term success. With the devastating events of Hurricane Harvey and Irma, the topic of how to handle major power outages was a timely topic and utility companies are working hard to find ways to minimize impact on its’ customers in such events. Solutions were presented involved the use of micro-grids instead of todays’ macro-grids to make power delivery more reliable. The solution basically is to use a self-sustainable power plant that is using solar panels. So if there is a major power outage on the normal grid it will ensure power to the customers within that grid. One of the most attended and interesting events was the fireside talk with President George W Bush. It was a very entertaining insight on his life as the President, and life after. He shared stories about his family and insights in to politics. He had a way to express himself that brought an audience to laughter with words like “Misunderestimate me” or “Nucularenergy”. He told us that meeting other high ranked politicians was like going to a school reunion. Not a lot of fun. Also that his daughter had not agreed with him on running for President by saying “OK, go ahead and ruin my life”. In short this was a great conference with many fantastic people. Thoughts on mobility solutions at SAP for Utilities conference in Huntington Beach, CA. City of San Diego (COSD) and Oklahoma Gas & Electric (OGE) have understood the value of using mobile solutions when it comes to customer satisfaction. Businesses that have many end customers that are dependant on getting information from a service provider when things go wrong, like in a case of a major power outage, could cause a really big strain on the callcenter of the company. Having for instance tens of thousands of people trying to get information at the same time will make the end customers very disappointed. Using the implemented real time, two-way communication platform Smart Customer Mobile (SCM) not only takes care of this but also provides the customer with useful information about real-time and usage history, billing, service requests, savings tips and a lot more. The customer only needs to login to a website and start the communication. In future upgrades this will also include on-line payment ability as this is not already implemented. There are many benefits to this as it reduces customer calls to the callcenter drastically, increases customer satisfaction and ultimately helps to achieve what a lot of businesses are chasing today – a great customer experience (CX). This is of upmost importance, since a dissatisfied customer might leave and also spread the word to others, making marketing to get new customers more challenging. In short, ensuring your business provides a mobile solution is a win-win scenario for both the company and the customers. XSR 2.0 Live! Check out our News and Services! We’re excited to announce that the XSR Site 2.0 went live today. In addition to great updates to existing content, we’ve now added a range of Services that provide more details for our existing and potential clients to explore, as well as News section where you can stay up to date on the latest news and events for XStreamReports. We look forward to sharing future news and updates! It was an exciting day at Tacoma Public Utility (TPU) when all of the great work on the new Utility Bill went live! On September 26th, TPU mailed the first redesigned utility bills, which were based on customer feedback and backed by the new technical solution with SAP and OpenText CCE implemented by XStreamReports. XStreamReports team was on-site to help ensure a successful go-live with the OpenText StreamServe solution we’ve been implementing for TPU during 2016. The new Utility Bill design was an effort by TPU where they partnered with Cognizant and XStreamReports to embark on a strategic program to deploy a next generation Customer Communication Management (CCM) solution. A solution that resulted in greatly improved flexibility for customer segmentation, tailored communications and ease of use for their business team to dynamically change customer communications. We’re excited to have been part of the journey with TPU, and thrilled for their successful launch of the new Utility Bill design! Stay tuned for more information, Case Study launch coming soon. 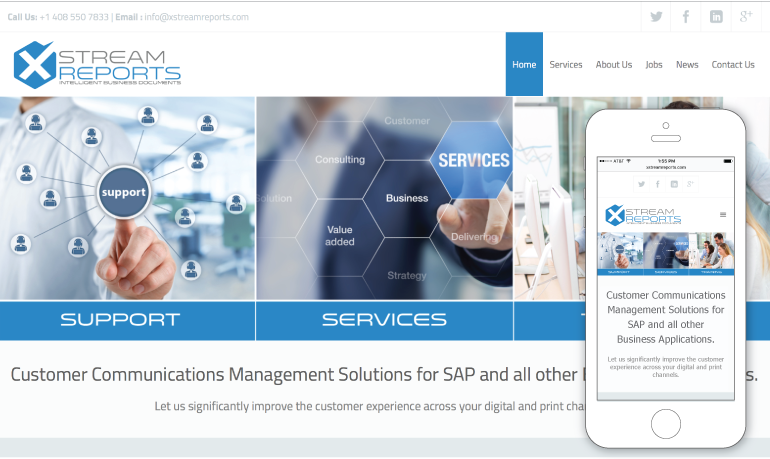 XStreamReports at SAP for Utilities! We are attending SAP for Utilities in Huntington Beach on October 9-12th, to hear best practices from utility industry leaders & experts. Meet us there!